In fact Emma, 25, felt like a Disney princess from top to toe on her big day. 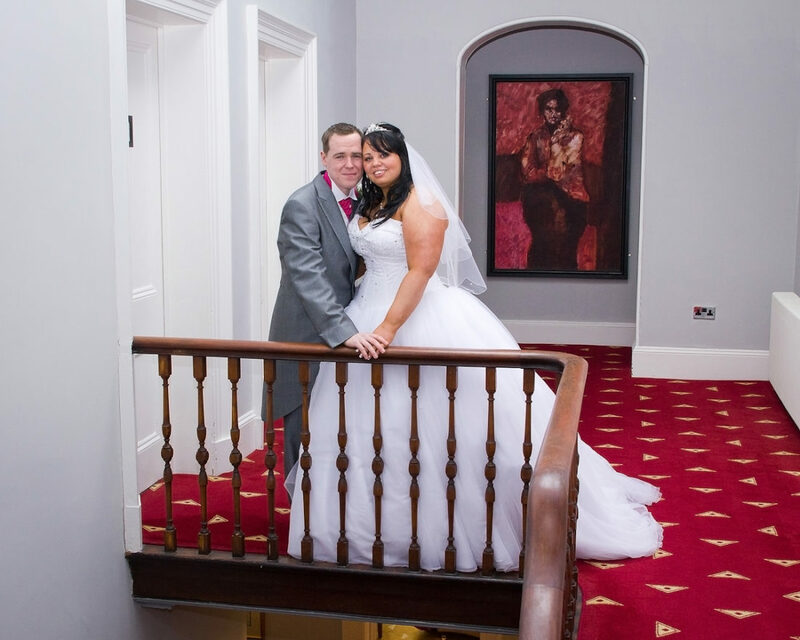 The social worker chose a dress that was reminiscent of Belle’s from the film Beauty and the Beast for her wedding to partner Matthew Cutts, 32.After the couple, from Bolsover, said their vows they walked back down Shottle Hall’s aisle to the sounds of A Whole New World from the Disney movie Aladdin. 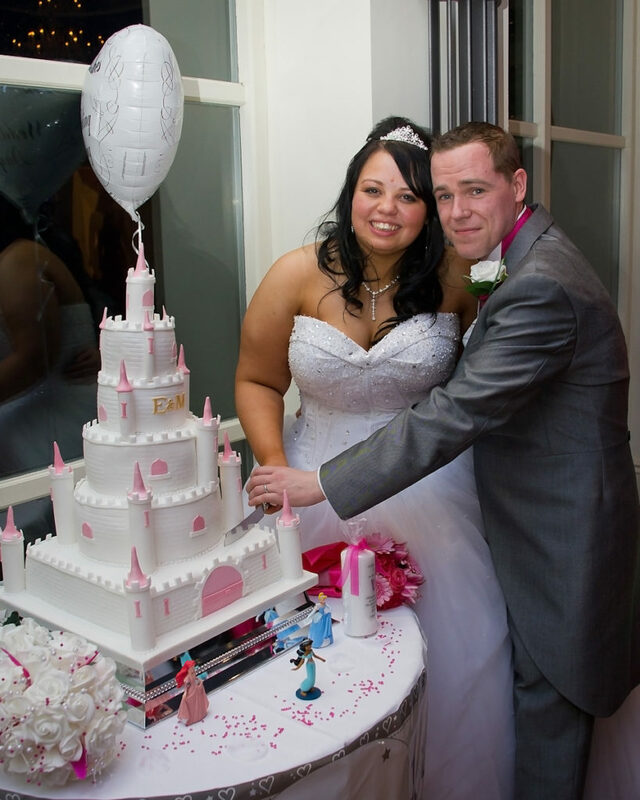 Even their cake incorporated the Disney theme: it was an enormous white and pink castle with Disney figures placed around the bottom of the cake. Emma, a social worker, said: “I have always been a Disney princess fan and as soon as I saw my wedding dress I knew it was the one I had dreamed about since I was a little girl. We’re confident that Emma and Matt are sure to live happily ever after. Wedding date: March 3, 2013. 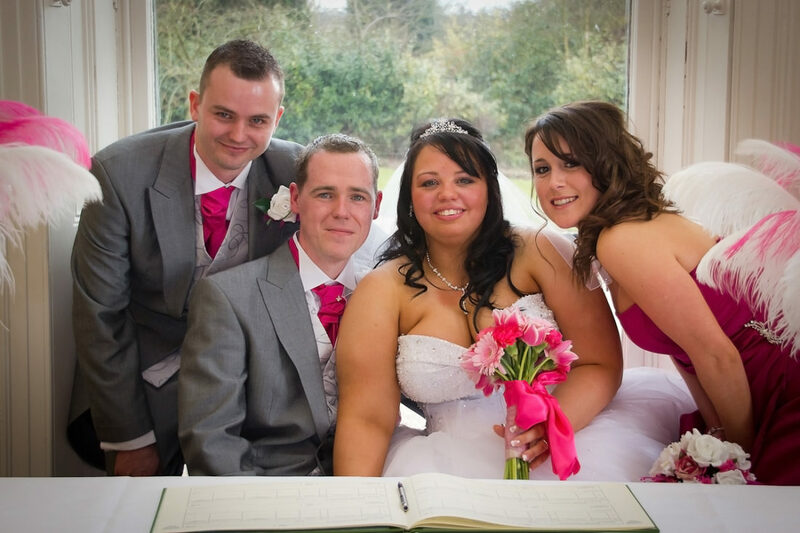 How we met: We were working in the same office – we both work from Derbyshire County Council. I’m a social worker and Matt is in IT so we met through work around five years ago. Proposal: It was on New Year’s Eve in 2010. I had absolutely no idea that Matt was going to propose although he had asked my mum and dad. He took me to one of my favourite places – Ashover Rock, where you have fantastic views all over Derbyshire. He took a bottle of champagne up there with us and got down on one knee, it was amazing. It was so cold though I could barely speak! He had bought my ring already from a shop in Nottingham. It is a white gold band with 13 diamonds set in it. He went ring shopping with his best friend and his girlfriend. They actually went round 21 shops before going back to the first – I think his friend wanted to strangle him. 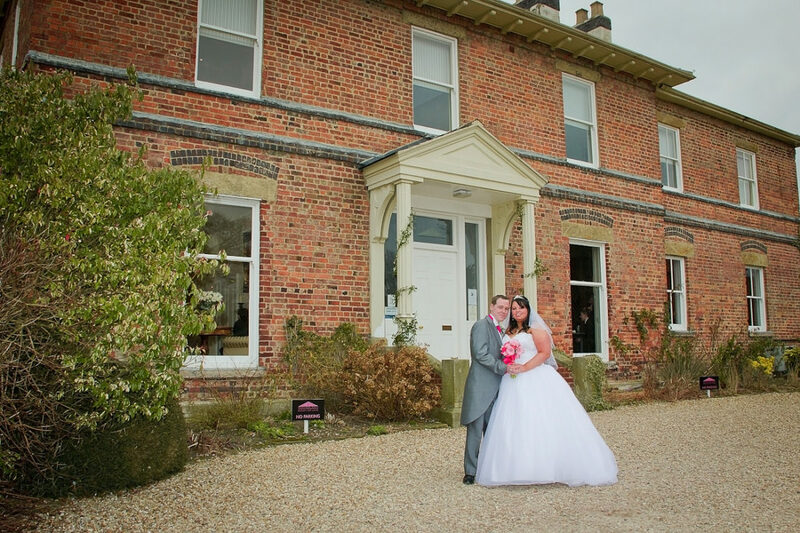 Shottle Hall: After we got engaged we didn’t really know where we wanted to get married, as we hadn’t been to many weddings. I’m not religious so we definitely didn’t want to get married in church, so we googled wedding venues and Shottle came up. We went to look round and completely fell in love – it was the only place we looked at. Everyone at Shottle was amazing – the staff, the food, the rooms. It was all absolutely perfect. Dress: Because I work in the community I actually drove past Bridal Belles in Bolsover when I was working. The dress of my dreams was in the window and so I made an appointment to try it on. I actually only tried two dresses on – and I only put the other one on because they made me! I just feel in love with his dress because it was absolutely perfect. It had a corset top completely covered in sparkles. Then it really went out from the waist with about 10 layers of chiffon – it was massive. I could barely walk down the aisle with my dad the dress was so big, but I loved it. I had always been a Disney princess fan and had always pictured myself in a dress like Belle from Beauty and the Beast. It was so perfect. 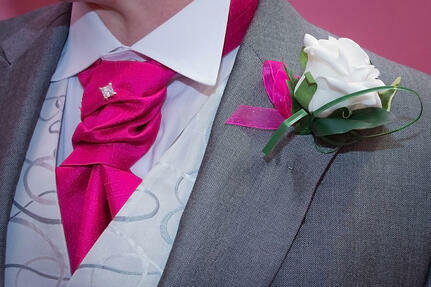 Groomsmen: They all grey suits with tails, but no hats, from Formal Affair in Chesterfield with fuchsia pink cravats. Matt, the best man and my dad all had waistcoats which were white with silver swirls and the other groomsmen all had dark grey waistcoats, just so they looked a bit different. Best man: Matt asked his best friend Chris Colley to be best man – he was the friend who went ring shopping with him. They had been friends for years and do computer gaming together. Bridesmaids: I had six bridesmaids - my two cousins, Emily Fern and Sarah Potter and four friends, Joanne Nunn, Heather Greenhough, Katie Madin and Donna Keeton. 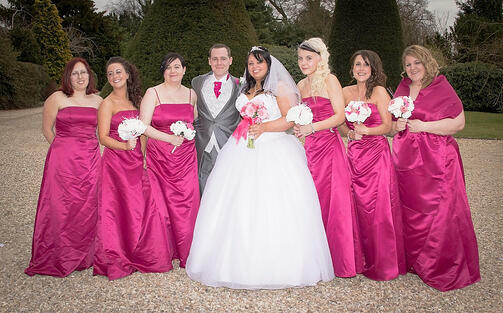 They all worse fuchsia pink bridesmaid dresses from BHS. I also had a flowergirl called Niamh (six) who wore a dress which was white with fuchsia pink butterflies on it. It was from BHS too and she picked it herself, so she was really happy. Hair and make-up: My mum’s best friend Clare is a professional make-up artist and hairdresser so she did all of us. 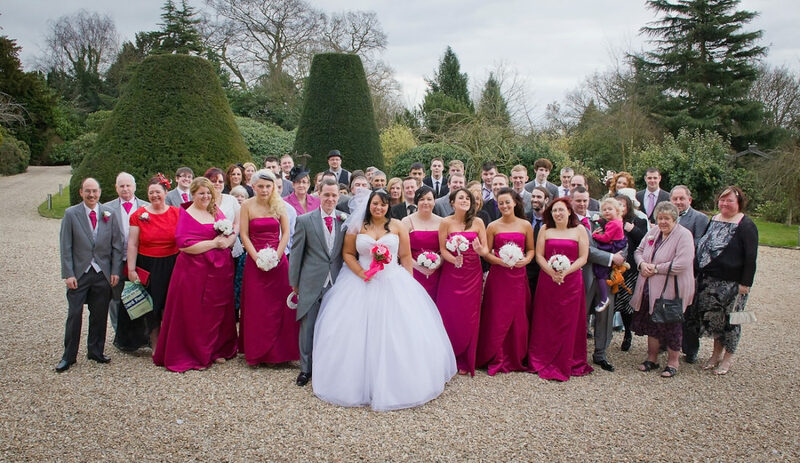 The bridesmaids, my mum and I all got ready at Shottle Hall in the morning. It was brill. Flowers: I made most of the flowers myself. I bought some silk flowers from ebay and with the help of one of my bridesmaids we made the bridesmaid’s bouquets and the buttonholes. We made the favours too, which were sweetie bags with our names and wedding date on them. I almost forgot I needed a bouquet, so I only ordered it a couple of days before the wedding, from a florist called Ibbotsons in Hasland. It was hand-tied, all different shades of pink and just beautiful. Ceremony: It was the only dry and sunny day in the whole of March I think, we were so lucky. I walked down the aisle to Better Today by Coffey Anderson which was music from a film we watched when we first got together. When we were looking for it for our wedding we discovered he had actually written it for his own wedding. We had two readings – one was by Garreth my brother and the other one was read by Matt’s mum Melanie. It was a beautiful service and everyone managed to keep it together, except my brother who cried his eyes out all the way through. People were ok until they looked at him – he set everyone else off. There were a few smiles when Matt completely forgot my name; the registrar had to actually remind him! It certainly broke the ice. We walked back down the aisle to A Whole New World from Aladdin – I had to get a bit of Disney in there. Reception: We had 65 guests for the day and just a few extra friends in the evening, who hadn’t been able to make it during the day. The reception was in The Orangery and we had vegetable soup for our starter, chicken with wilted spinach for our main and profiterole for pudding. The food was amazing and everyone commented on how good it was. I decorated the room myself. 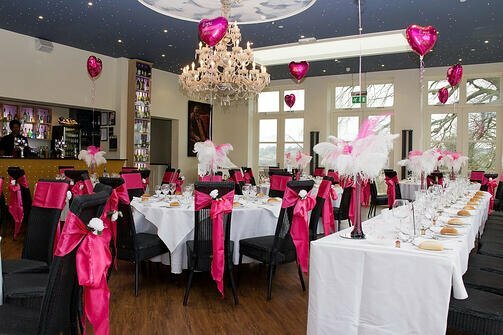 I put fuchsia pink sashes on the chairs and scattered pink crystals on the tables. I bought some pinky purple vases and filled them with pink feathers and a pink love heart balloon with our names and wedding date on them. We had three on the top table and then one in the centre. We had all the usual speeches, plus an extra one from my brother. He kept disappearing during the meal and I wondered what he was up to. It turned out Garreth and his mate had made a video of our love story – with the two of them pretended to be me and Matt. It was mortifying (and hilarious) seeing my brother pretending to be me! The reason he kept disappearing was that he had added some pictures of the actual wedding at the end – which made it really special. It's on youtube now - you can watch it here! Evening: We had a buffet in the evening – although I didn’t eat anything because I was a bit drunk by then! We had a DJ called Chris Wood who we had seen at a friend’s wedding. Our first dance was to Just the Way You Are, by Bruno Mars. I had wanted to learn a routine and put on a bit of a show but Matt said it would be too embarrassing. What happened instead is that he got his foot stuck in my dress, fell over and when he tried to get up pulled me over too! So, that wasn’t embarrassing at all. People had been quite emotional watching us dance and you could see people dabbing away tears. By the time we had both ended up on the floor they were wiping away tears of laughter! Cake: My cake, which was amazing, was in the shape of a Disney Princess Castle and I had lots of Disney Princess figures stood around the bottom. It was made by Cameo Cakes and I just loved it. 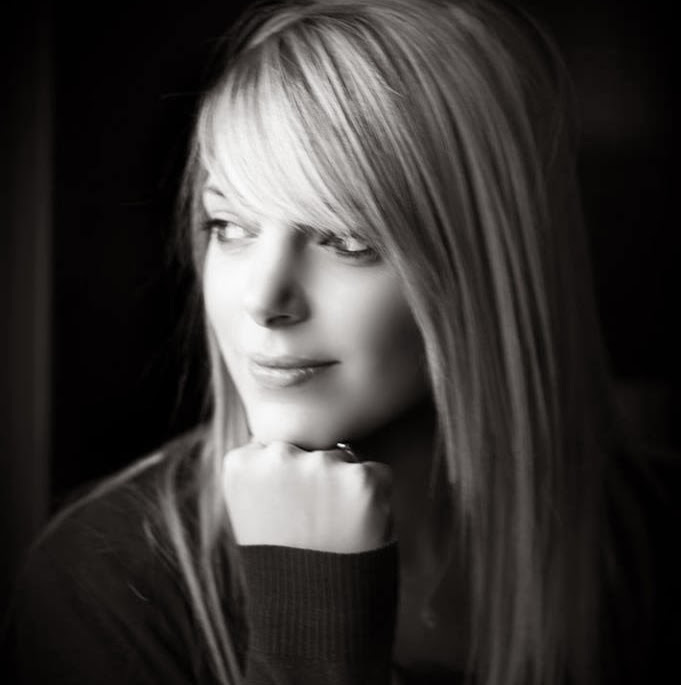 Photographer: We had a guy called Sean Daysh who is just becoming a professional photographer. He spent ages with us and took over 1,000 pictures and at first peak they look amazing. He also brought his brother Simon along who took a video too – which was an added bonus we hadn’t expected. Honeymoon: We couldn’t have any annual leave until April, but had tentatively booked a break in Cyprus. Luckily, we have been able to change it to Majorca and so we go there in May. I’m glad we left it a bit because I came down with the flu straight after the wedding and spent several days in bed. And this way we still have the honeymoon to look forward too.